Before the 2015 legislative sessions, I spoke before the Transportation Committee and upon a request by Yellow Cab management wrote this letter to Sen. Wirth and Sen. McSorley. Shortly after the TNC Act bill was killed in the Senate, Senator Cisco McSorley called me, inviting me to lunch. He said it was this letter that changed his position on the Transportation Network Company Act, and to filibuster it. That’s why it died in the Senate and did not become law. There is another ‘Street Fight’ coming, and you can be a part of it. Subscribe to Call-A-Cab and become part of its Internet saturation of ads and listings. Download the tracking apps at https://taxiabq.com/driver-application.html and call me. Six weeks ago I filed a response to Hinter-NM’s (Uber) motion to the NMPRC for a rehearing on rule changes. Basically, I informed the PRC that Uber’s GPS logistical advantage was not based on an advanced technological platform (innovation), but an organized saturation of a territory with illegal ‘gypsy’ taxis. You see, that is Uber’s legal argument, based on a Supreme Court decision back in the 1800’s, that innovation supersedes government franchise. So, does Uber deserve to have its illegal taxis legitimized by changing the law? I proposed Uber’s argument was rendered invalid; my ‘proof’ being Call-A-Cab’s GPS platform had equal logistics plus superior access essential for true public conveyance, but relied on legal taxis. Two years of field testing and customer response proves this is true. The filing also included former Director of Transportation Division Ryan Jerman’s memo that under existing law, taxi companies could incorporate driver-owned luxury vehicles. Therefore, there is no need for rule changes downgrading Motor Carrier Act safety regulations just to accommodate one company who couldn’t figure out how to do it legally; and, especially for a company organized to monopolize that category of transportation business to the detriment of taxi service in Albuquerque. Call-A-Cab can do what Uber does, and legally. However, if we don’t DEMONSTRATE this in real time, the argument above is merely academic. That is why Call-A-Cab is free to drivers, free tracking and being part of all the advertising, free. We need to demonstrate Call-A-Cab can equal if not exceed Uber’s logistics. However, the number of drivers on the GPS map is CRITICAL because if we don’t have enough drivers to handle increased demand from ramped up advertising and promotion, customers accessing the GPS map won’t find any available taxis, which is only acceptable, briefly, during occasional peak demand periods. Call-A-Cab was launched August 6, 2013. Nine months later, Lyft and Uber entered the Albuquerque market. We had the advantage, and still do, but that window is about to be shut and the door barred. There has been a continuing orchestrated media attack against taxis opening the way for Lyft and Uber to become popular alternative to ordering a taxi. Hell, we saw a new one in the Albuquerque Journal just last week. The battle has also been going on through lobbyists and lawyers. However we, as legal taxi drivers, have lost almost every step of the way. 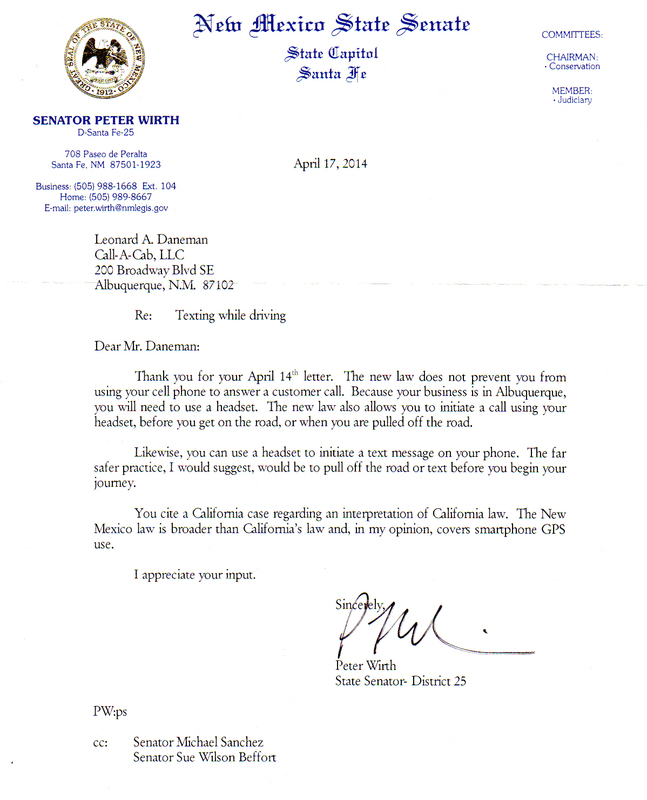 Just last March we lost unanimously in the NM House, and if it wasn’t for a letter I wrote to a state senator who taught my Business Organization class back in 2004, the TNC Act would have passed in the Senate too and Lyft and Uber would now be legal entities. The battle is not won but is continuing; in the streets, the newspapers, and the courts. Uber ramped up its Albuquerque operations, openly advertising for more drivers in order to saturate their market penetration, illegally, with the plan to become so entrenched lawmakers would be forced to ‘legalize’ them. Uber has filed in the NM Supreme Court and the NMPRC for reconsideration of PRC rule changes outside the Motor Carrier Act, rules making their current business model legal . . . and . . . making local competition with them next to impossible. I predict the NM Supreme Court will order the NMPRC to schedule a Rehearing for Rule Changes; and the current NMPRC is even more supportive of Uber. So, we have one last chance to kill Uber. But, we have to work together as an unofficial Association of Independent Contract Taxi Drivers. Call-A-Cab works. Customers say we come up first in Google Search, and some say they call us second or third after trying other numbers, pleased not to be put on hold. Some even are attracted directly to the GPS map and call the closest cab. Yes, it does happen and I know because I keep one smartphone line dedicated to calls from the map, and map only. Call-A-Cab is at the top of Google AdWords, Map Results, and often takes up half the ‘organic’ listings on Page One. And that includes being #1 in yp.com, taxifarefinder.com and being the company AAA calls when a traveler breaks down one hundred miles from Albuquerque. However, we need one final push to make Call-A-Cab a ‘brand,’ just as Uber has done. But I don’t dare do that until enough drivers have signed up for being tracked on the map to handle that kind of demand. I need a dozen day drivers, and at least eighteen night drivers to start. With the breakup of the cab companies when the Motor Carrier Act was revised in 2013, no one cab company can provide that number of drivers. So, Call-A-Cab wants to represent all the best Independent Contract drivers in Albuquerque, no matter what company you work for. And that is a good thing, being able to separate ourselves from the ‘old taxi’ business model and embrace the new . . . and, by the way, Call-A-Cab when used as designed can be faster and easier to use than Uber. If this ‘last chance’ campaign is successful, the Rule Changing Hearings in the NMPRC stand a good chance of failing. If we have enough drivers, yes. When I first started Call-A-Cab, about a dozen drivers signed up and about October, before Thanksgiving, the Albuquerque Journal sent a reporter to write an article. She was resistant and commented, ‘I only see six taxis on the map. Anyway, I don’t take taxis.’ And she killed the article. And that was before Lyft and Uber exploded into the market May of 2014. So, the Albuquerque Journal editors know about Call-A-Cab. Last year, the Journal published the Guest Opinion, ‘Street Fight,’ which included my article they titled, ‘Need a lift? Call a Cab not a Lyft.’ In the adjoining column, they printed the opposing opinion written by two ‘Startup Community Facilitators’ representing Lyft and Uber, explaining how Uber was a boost for the public and the economy. Again, the Albuquerque Journal knows about Call-A-Cab and talk radio is always looking for the latest controversy to fill air time. Apple iPhones won’t accept the program as it conflicts with iOS battery saving power management. I recommend Apple users to wait, or get a cheap Android as a second tracking/business line. Many drivers already use two lines for a variety of good reasons. A Dr. Charles Murray, a libertarian political/social scientist famous for his controversial book ‘The Bell Curve’ discussed UBER as an example of a new order of Liberty in the fight against an over-regulated society. Now, he just called taxi companies Monopolies [sic] when they are state-certified franchises. I mean, anyone can’t just open up a Subway . . . you first have to purchase a franchise from Subway, and you can’t build in someone else’s territory. What he did get right was what I put in my Legal Memorandum to Yellow Cab and their attorney, and as a follow up to Senator McSorley. The popularity of UBER is what is driving the failure to enforce regulations, and there is legal precedent for a ‘state’ to ignore existing franchises in order to improve an industry. The REAL ISSUE in New Mexico, however, is that Call-A-Cab existed prior to Lyft and UBER, and not only had better logistics but did it legally, within the existing regulatory structure, and is more accessible than Lyft and UBER. Look, those safety regulations came out of real life issues concerning drivers and taxi maintenance. Taxi drivers are vetted at a much higher level than UBER’s, and taxis are clearly marked and mechanically inspected, from top to bottom, every 4000 miles. Yes, a Taxicab may not be as immaculate as a personal car used by UBER, but that taxi is driven as many as 500 miles a day almost every day of the week. Each day, as many as 24 customers get in and out, track dirt and trash, smoke cigarettes . . . plus, the 4000 miles a week racking up on the odometer. Uber uses technology to create efficiency by enabling supply to match demand. Okay, but is that entirely true? Yes, Uber uses GPS technology and a Smartphone App. However, that is not what is the key. What makes Uber more efficient is their contracting of illegal part-time drivers who do not have to commit to a 12-hour shift in a legal taxi. GPS contributes the more efficient ‘proximity’ method of call dispatch distribution. However, without the fluid supply of almost unlimited drivers and cars, at no cost to Uber by the way, their system wouldn’t work. No cost? Taxi companies are regulated for safety, NOT TO BLOCK COMPETITION. By using un-vetted drivers (no DOT exams, criminal background checks, drug tests, regular driver record submissions) and unregulated vehicles (no 4000-mile mechanical inspections, no markings, no commercial insurance, no on-spot mechanic or tow service), Uber saves a lot of money. Oh, and add the fact Uber collects nor pays gross receipts taxes . . .
IS THAT MORE EFFICIENT? YES. BUT IS IT FAIR? NO. IN FACT IT IS DOWNRIGHT ILLEGAL. But this blog is about Call-A-Cab, so time to get back to shameless self-promotion. Four years ago, I struggled with how to meet peak demand, like large hotel checkouts or bar rush. I suggested Yellow Cab create a cadre’ of cab drivers who could be on-call to handle peak demand using their own vehicles. What kyboshed the plan was no underwriting for part-time commercial use of a personal vehicle. Now, I had been using GPS attached to my Motorola Q (a cross between the Motorola Razor and a Blackberry) since 2006. 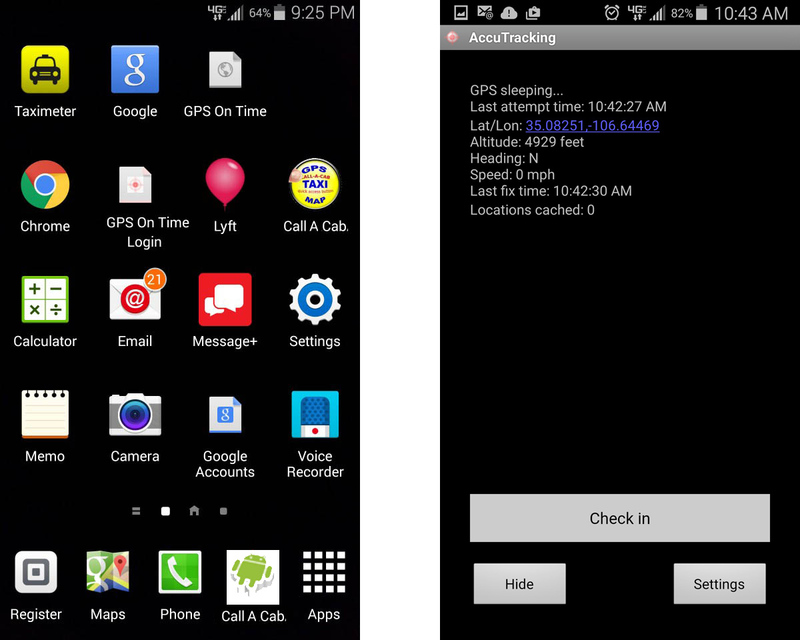 So, 2012 I started researching taxi tracking by GPS and Smartphones and created the website https://taxiabq.com, Call-A-Cab. It was officially launched live August 6, 2013. Call-A-Cab worked on the premise that Radio Dispatch worked fine during normal business, but when demand resulted in customers being put on hold the delays in service were unacceptable. 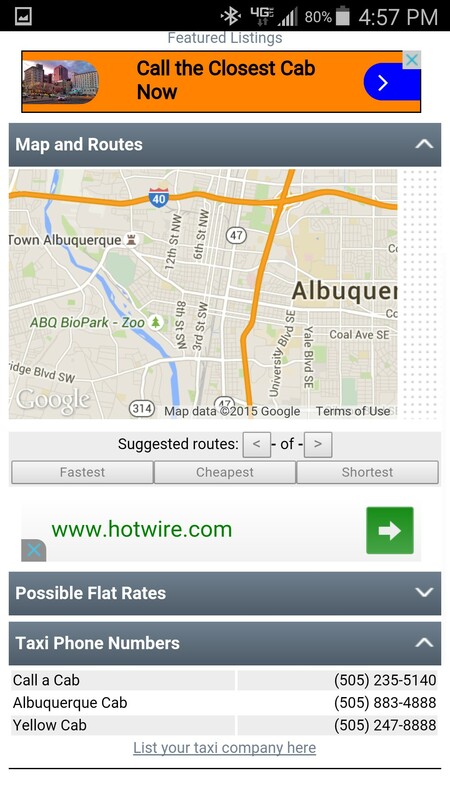 With the proliferation of Smartphones, I felt customers could hang up and access the https://taxiabq.com URL and call the closest cab right off the GPS map. This new efficiency would be a taxi picking a customer up in the time it would have taken them to wait on hold and a taxi finally dispatched! In other words, after waiting on hold seven minutes, giving pickup information to the operator, and the operator giving that information to a radio dispatcher, it could take ten minutes for a cab to finally start out on the way to the pickup. With Call-A-Cab, the customer would call the closest cab, give the pickup information in ten seconds, and the taxi would arrive in ten minutes. Now, that sounds like Uber, doesn’t it? Well, because of direct phone contact with the taxi it is actually more efficient, and all of the taxis and taxi drivers are LEGAL! And, it launched in Albuquerque almost a year ahead of Lyft and Uber. Now, Lyft and Uber want the government regulatory agencies to change the law to accommodate their business models. Well, I have news for them. They should have done it legally in the first place. Call-A-Cab did! Lyft and Uber ‘skating’ on taxes? After four months I FINALLY got through to the auditor at Taxation & Revenue. I was given the runaround, until I caught her in a trap which forced her to actually do some digging on her computer. Randy was there, listening in on the phone call. I am pretty darn sure Lyft and Uber (Hinter-NM LLC) are not collecting or paying gross receipts taxes. First evidence, they refused to produce specific business records, receipts and a list of their contract drivers, at the PRC hearings. “Proprietary information,” their attorneys said. If they were filing GRT, those records could be available for production at Taxation & Revenue. Then, I read the Lyft driver agreement and there is NO mention of gross receipts taxes being part of the ‘fare,’ — what they called a ‘donation’ — nor 7% GRT added to a driver’s commission. The ‘donation’ itself was a clue as well, as it was a direct obfuscation (just like Lyft and Uber were careful not to call themselves ‘taxi’ services but a quasi-carpooling ‘rideshare’) . . . all to avoid tax liability. Finally, at the Bernalillo County District Emergency Injunction hearing one of the Lyft attorneys jumped up and told Judge Franchini that they were filing 1099’s for all the drivers. Now, a 1099 is a federal tax form required for all contract payments to non-employees paid over $600. However, that has nothing to do with Gross Receipts. I sent the Taxation & Revenue forensic auditor the information she requested. Her ears perked up even more when I told her Lyft and Uber probably owed about $15,000/month in taxes. I sent a copy the email to Yellow Cab and Speaker Sanchez. Once the auditor determines tax fraud, the information will not be released to the public . . . so, it is up to the attorneys, Cadigan and Sanchez, what to do from there. I don’t do a lot of paralegal work, but my research has proven useful on a few occasions. Analyzing evidence was part of the challenge in putting together a case. First, what were the legal concepts in tort or criminal law? Then, what evidence was proof, and how would you obtain it? I forgot to mention two more incidences ‘evidence’ of Lyft and Uber’s tax fraud. One, I personally know a driver who had to get their own business license and pay 7% right out of their Lyft commissions. You see, there is no way for the contractor to ‘bill’ Lyft for local taxes. The second is the HB194 Transportation Network bill itself. It is embarrassing and a shame it passed in the House, because one section that survived revision was the ‘exemption from local taxes.’ What did they mean by ‘local?’ Mayor Berry, an early supporter of Lyft and Uber should be advised that by taking half the taxi business away, so goes local and state tax revenue. And, as I pointed out in the post, Lyft and Uber are probably doing enough business to warrant $15,000 per month in gross receipts taxes. Prior to designing Call-A-Cab, I studied distracted driving and the only driver interfaces are the Driver ‘in/out’ application and use of the cellphone itself. The first screen is like any other, including easy access for essential operations such as Phone, Google Maps, Square Credit Card, and the Call-A-Cab application. These are easy to find with barely a glance and one thumb to open. The Call-A-Cab driver app, once opened, is a plain black screen with a bar going across the entire screen, requiring just one fat thumb to operate and barely a glance to confirm update. It is one button for checking either ‘in’ or ‘out’ of the map. Call-A-Cab is designed for customers to find the GPS map and locate the closest available taxi, and Autodial that taxi to talk directly to the driver. The driver is then on the way in about 10 seconds. This short time is essential to start competing and beating Lyft and Uber claims of servicing calls in ten minutes. The driver doesn’t have to take notes or text information. The customer’s phone number is in the Smartphone call history. However, answering the phone conflicts with Anti-Texting and local Cellphone use laws (cited below). I see some drivers using Bluetooth earpieces or in-line Earbuds, but the sound quality is iffy and I find in-ear devices uncomfortable. I prefer an inexpensive Bluetooth speaker. 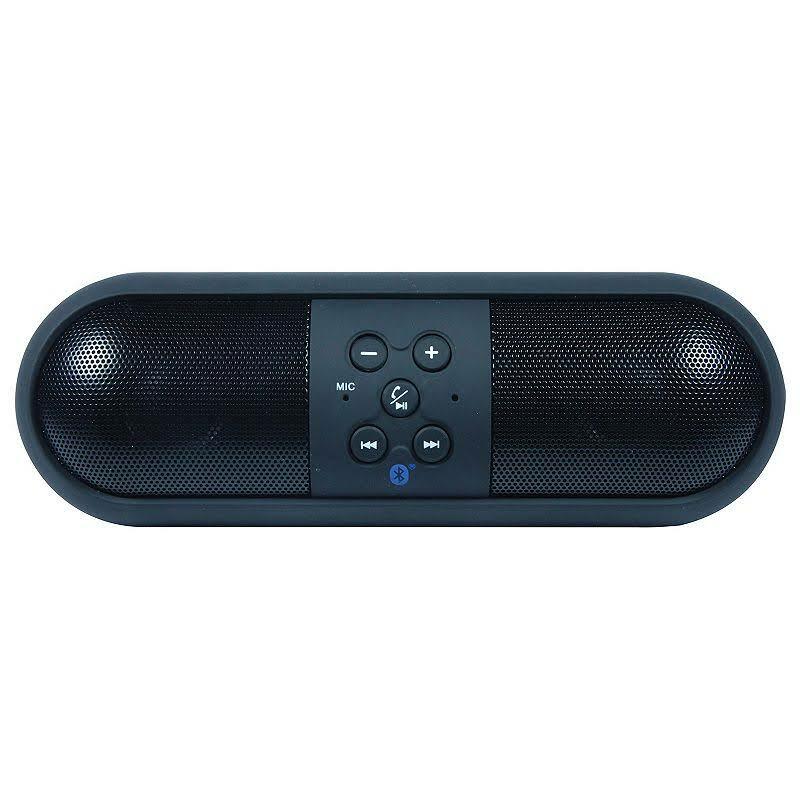 The Bluetooth speaker not only allows you to play radio or broadband programming, but only requires a push of a button to activate the Speakerphone, and customers tell me the sound quality is excellent. The Craig is available at WalMart or Office Depot for $15 to $20. A. A person shall not read or view a text message or manually type on a handheld mobile communication device for any purpose while driving a motor vehicle, except to summon medical or other emergency help or unless that device is an amateur radio and the driver holds a valid amateur radio operator license issued by the federal communications commission. B. The provisions of this section shall not be construed as authorizing the seizure or forfeiture of a handheld mobile communication device. Unless otherwise provided by law, the handheld mobile communication device used in the violation of the provisions of this section is not subject to search by a law enforcement officer during a traffic stop made pursuant to the provisions of this section. (3)	“text message” means a digital communication transmitted or intended to be transmitted between communication devices and includes electronic mail, and instant message, a text or image communication and a command or request to an internet site; but “text message’ excludes communications through the use of a computer-aided dispatch service by law enforcement or rescue personnel. If you go to the first blog entry, I discuss the issue of too many cabs at some times and not enough during peak demand. I suggested a cadre’ of drivers certified and insured to use their personal luxury sedans, or SUVs and Minivans to put in extra hours. The same boost in cars available can also be done by creating a six or four-hour exigency shift, the drivers using regular taxis or ‘luxury’ Checker black cars, town cars. A day driver having worked 3 day shifts would be able to work a half-shift at night during special events or for weekend bar rush. 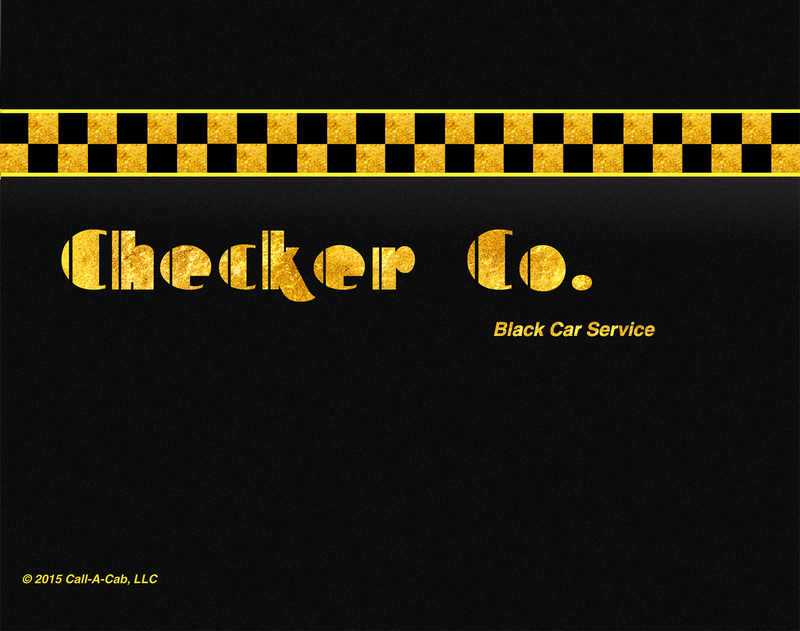 Checker has a long history, even making their own cars, some luxurious. I drove a Checker Marathon in Philadelphia for three months back in 1981. That car was roomy, could hold a lot of people.